When my alarm sounded at 5am ‘excited’ wouldn’t be the best word to describe my feelings for getting up. I had a good sleep, but for some reason I was still very drowsy. I tossed and turned for 30 minutes while thinking about the long day I had ahead of me. I finally decided to retire from the tent somewhere around 5:45. 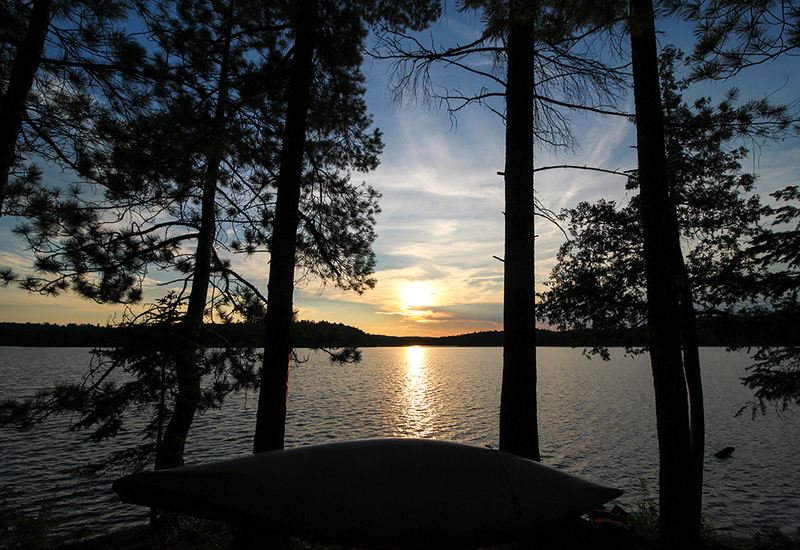 The first thing I noticed when I unzipped the fly of my tent was the beautiful sky over the vast, calm waters of Manitou Lake. I follow the same routine every morning while I camp. First I grab my food bag which I always hang from a limb a good ways away from camp, I then collect water for coffee and oatmeal for breakfast. While my water comes to a boil I pack up everything inside my tent (clothes, sleeping bad, etc.) I then make my coffee, and while it cools down I take down my tent. This gives me some relax time to enjoy my coffee, which is my favorite part of every morning! As soon as I finish drinking my coffee I make 3 packets of instant oatmeal, then while that cools I get my pack ready for the day, so as soon as I’m done eating I can give my cup a quick rinse, pack it up, and off I go! This whole process from the time I wake up to the time I get on the water usually takes around 45 minutes, or closer to an hour if I have a short day. It was approaching 7am as I took my first paddle strokes of the day. I knew I had one of my longest ever days ahead of me, but I still wasn’t in much of a rush. I find it very difficult to rush on a beautiful morning like this; and besides I wasn’t very excited to do the 3km portage into Three Mile Lake anyways. I didn’t know what to expect on this portage. I only really knew two things about it.. It’s the second longest portage I’ve ever done and it gains just over 60m in elevation in the first kilometer of trail! How bad could it be?! I lashed my paddle in the canoe, threw my pack on my back, threw my canoe on my shoulders and off I went. The portage didn’t look too intimidating from the landing, but about 100 meters in the gain in elevation started. I tried not to look up the massive hill in front of me as I struggled to climb over the many rocks and roots. Finally I had enough, after only a few minutes of single carrying I couldn’t do it any more. I threw the canoe to the ground and decided I would take two trips up this mountain. When I looked back after dropping the canoe I noticed I could still see Manitou Lake, which wasn’t very encouraging at all. When I reached the top of the mountain I dropped my pack and went back for the canoe.. it was much more manageable this way, and I’m glad I made the decision to double carry. After getting the canoe to the top I took a little break, sitting down on a freshly fallen tree. From here the trail was very easy and straight forward, I powered through the rest of it with both my pack and canoe on my back, taking only one single break at a canoe rest along the way. 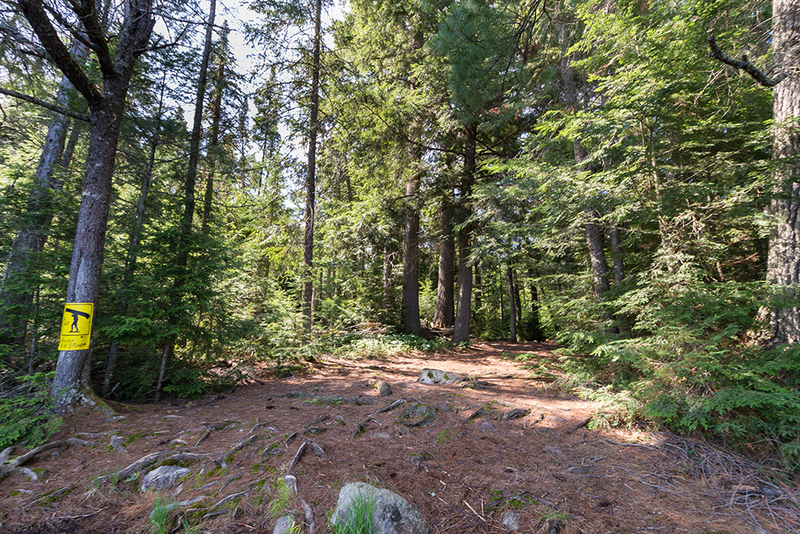 Close to half of the trail follows an old logging road, making for easy travel. In total it took me just over an hour to complete, which I was pretty happy with. Three Mile lake was quite inviting, like Manitou it is a very large lake but the water was as smooth as glass. About 5 minutes into my paddle I crossed paths with yet another solo canoeist. We weren’t close enough to exchange greetings, but I couldn’t help but notice he was trolling as he slowly made his way down the lake. Just after passing by him I heard some splashing, and when I looked over I noticed he had caught a fish (probably a lake trout). I immediately put my line in the water and trolled the rest of the way to the portage into North Sylvia Lake, but unfortunately I wasn’t as lucky. This would be the last time using my fishing rod on this trip. The 550m portage into North Sylvia Lake started with another steady incline, which became the norm for the rest of the trails today. I single carried it in just over 10 minutes. 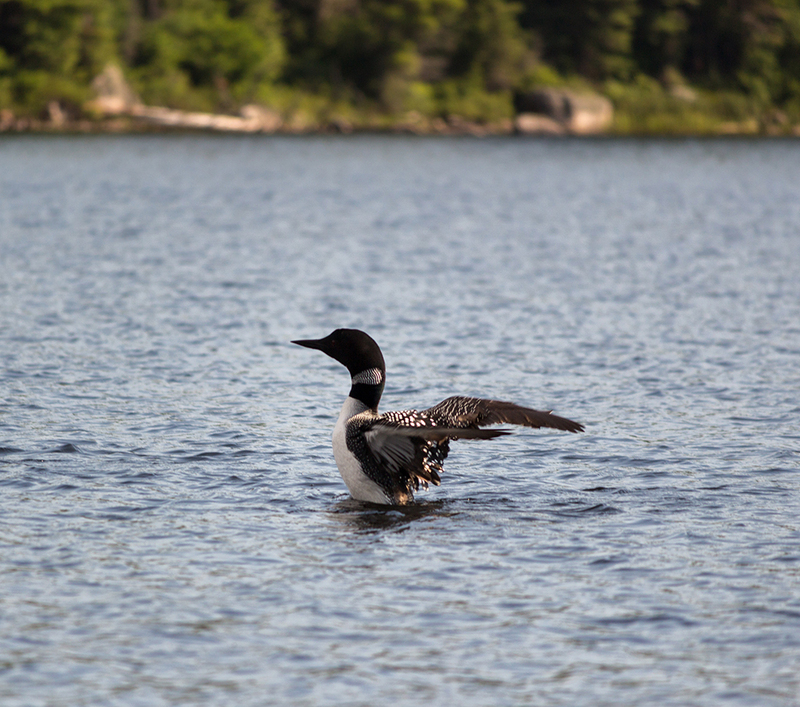 I don’t remember anything about North Sylvia Lake aside from a family of loons that were playing in the middle of the lake. 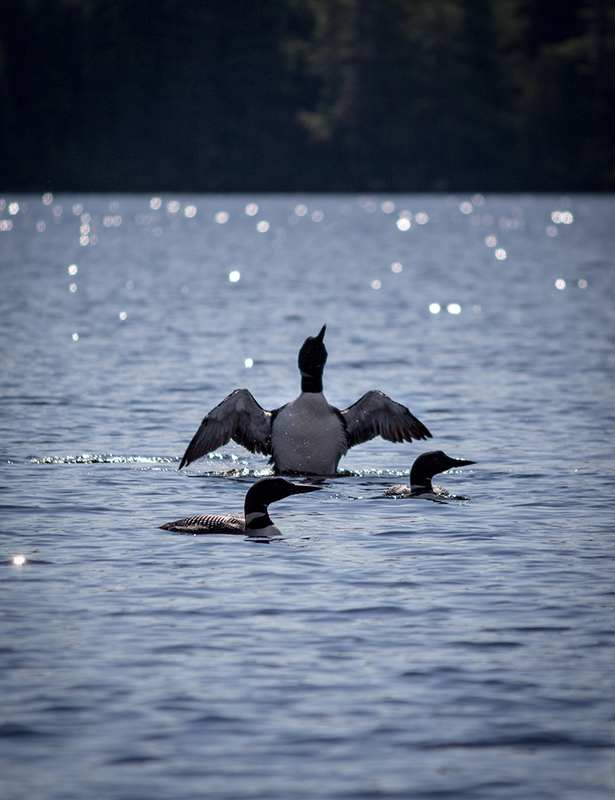 It was amazing to watch them as they splashed around in the lake together. I think I counted 8 of them in total. I sat in my canoe for a good 30 minutes watching them. After watching the loons I made my way towards the 660m portage into Boggy Lake. Again this trail started with an incline but leveled out approx. half way through for the rest of the way. 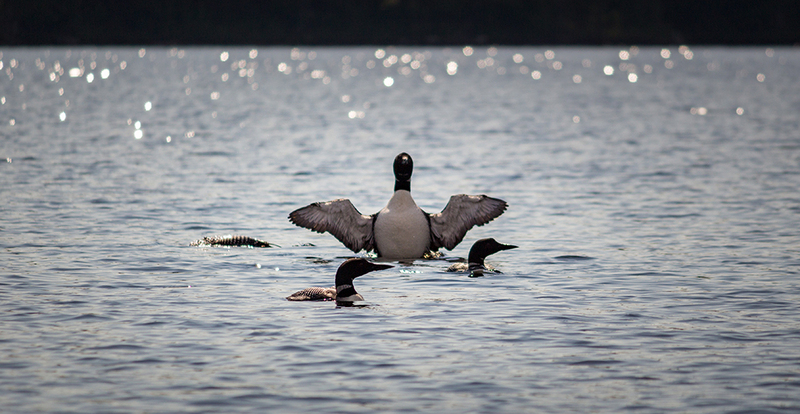 Boggy lake wasn’t all that exciting so I didn’t even bother pulling out the camera. Next came the 1490m portage from Boggy Lake to Dahinda Lake. The only thing I remember about this trail is.. well you guessed it.. another steady incline to get your heart rate up for the rest of the trail. Another thing I noticed here was the bugs were absolutely terrible! They weren’t bugging me as much as Athena, she was not a happy pup! I single carried the first half, but I was getting very tired so I decided I would take two trips for the rest. I arrived on Dahinda Lake at around 1PM. Dahinda Lake was similar to Boggy Lake, essentially that’s all it was.. a large bog. 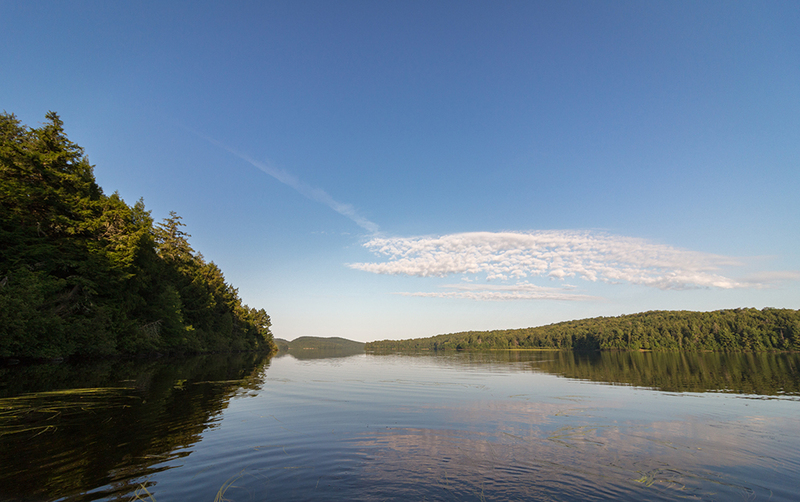 I had trouble finding the narrow channel into Ratrap Lake, but once I found it it was a quick and easy passage. 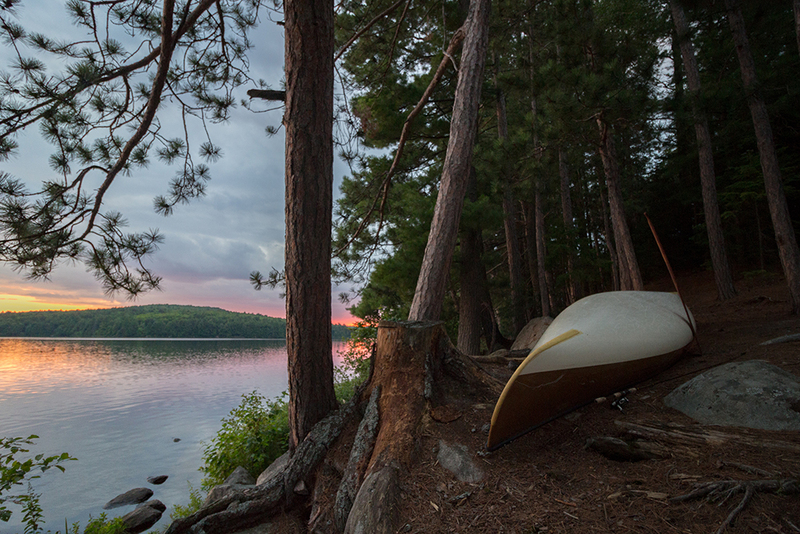 I’ve always been curious about the campsite on Ratrap Lake so I paddled close to the Island as I made my way across. The site looked decent, but far from spectacular. I would definitely stay here in a pinch with no complaints, though. I was very happy when I approached the final, and smallest portage of the day.. a short 390m into Maple Lake. I was very tired at this point and couldn’t wait to get it over with. I single carried this trail in under 10 minutes. Just after arriving on Maple Lake I noticed Athenas eyes and face were starting to swell up considerably. She must have had a reaction to the deer and stable flies on the Boggy to Dahinda Lake portage. Half of a Benedryl capsule was on order for her as soon as we reached camp.. 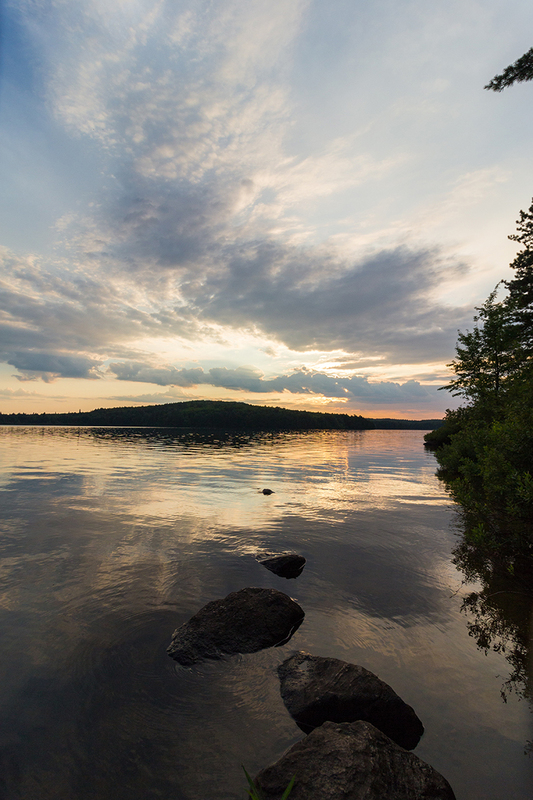 I had been to Maple Lake in the past, but never ventured into the Southern section of the lake. 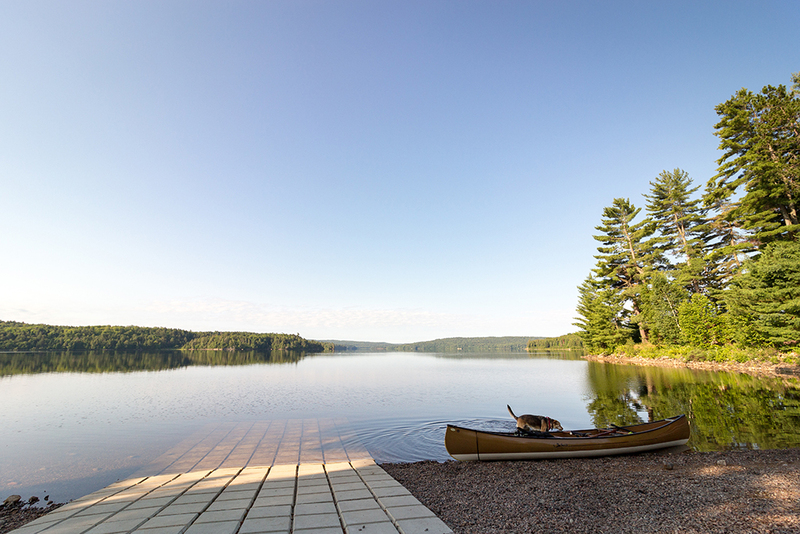 I had only previously camped on the Island near the Maple Creek portage. I had read online that the two Southern most Island campsites were amazing, but for some reason I wasn’t overly impressed with either as I paddled by. I kept going for the other island to the North-East. The campsite here has a massive staircase from the landing area up to the actual site itself. Again I wasn’t overly impressed with this spot but I was too tired to explore any further, so I setup my hammock and gave Athena a Benedryl. At this point she could hardly open her eyes! I felt very bad for her so I let her nap in the hammock for a good hour while the medication worked its magic. When she woke up the swelling was almost completely gone which I was thankful for (I think she was too). 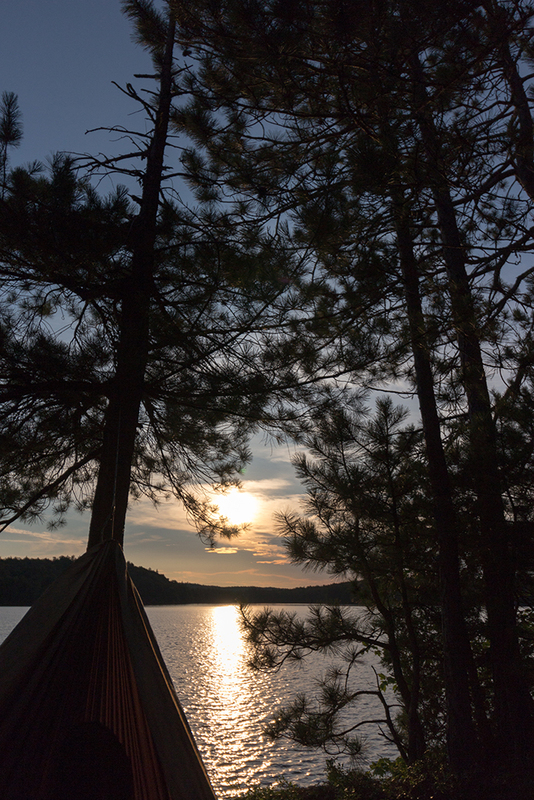 I decided I actually preferred the other sites I had checked out earlier over this one so I packed the hammock back up and made my way back across Maple Lake. I ended up snagging the Southern Most Island site. It was very exposed and as a result I got a healthy dosage of vitamin D this afternoon. I spent the rest of the afternoon lounging around drinking Tang mixed with a bit of vodka which was very refreshing. Supper tonight was hamburger helper with dehydrated ground beef, onions, and mushrooms. I also made bannock to go along with it. For some reason I found this meal rather salty and I actually had a hard time getting it down. I finished eating around 7PM and finished my camp chores (dishes and firewood) shortly there-after. 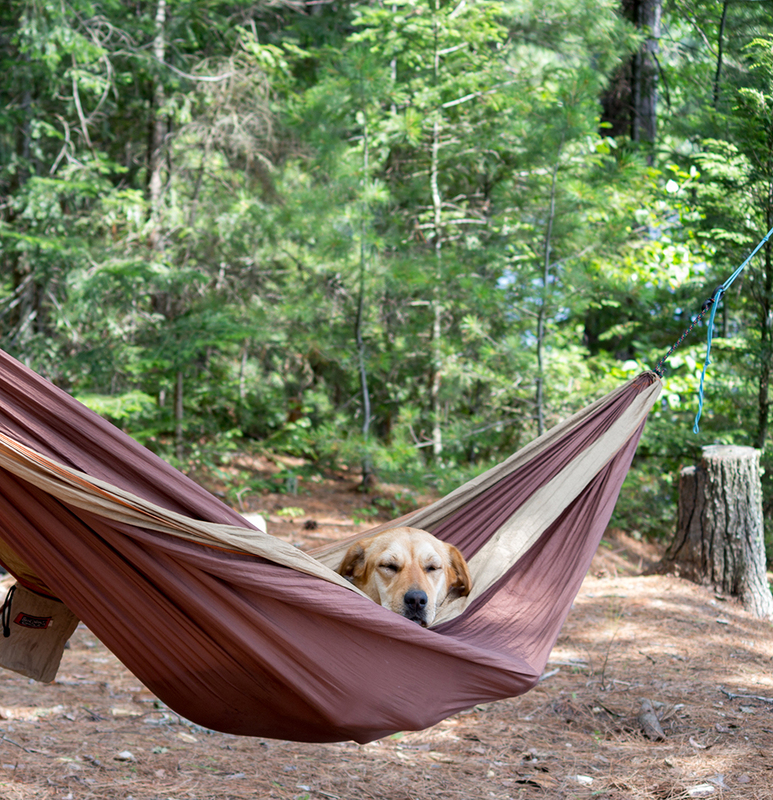 At around 8 Athena asked me to go to bed so I let her in the tent for the night, and I lazed around in my hammock drinking a cup of whisky. I took a few more photos while watching the sunset, then retired to the tent as soon as the ‘golden hour’ was over once again. I had a very short day ahead of me tomorrow, so I didn’t bother setting an alarm. The last thing I remember before drifting off to sleep was listening to a owl hooting off in the distance.. it doesn’t get much better than that!.. 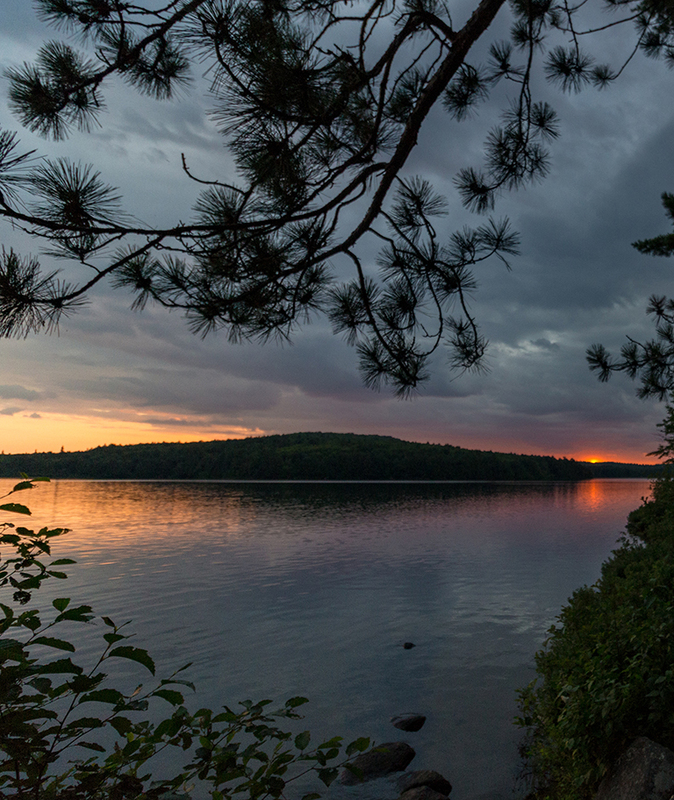 On July 29 I started a last minute trip through the Kioshkokwi Access point in Algonquin Park. I had a 6 days off work so I figured what better way to spend my time off! 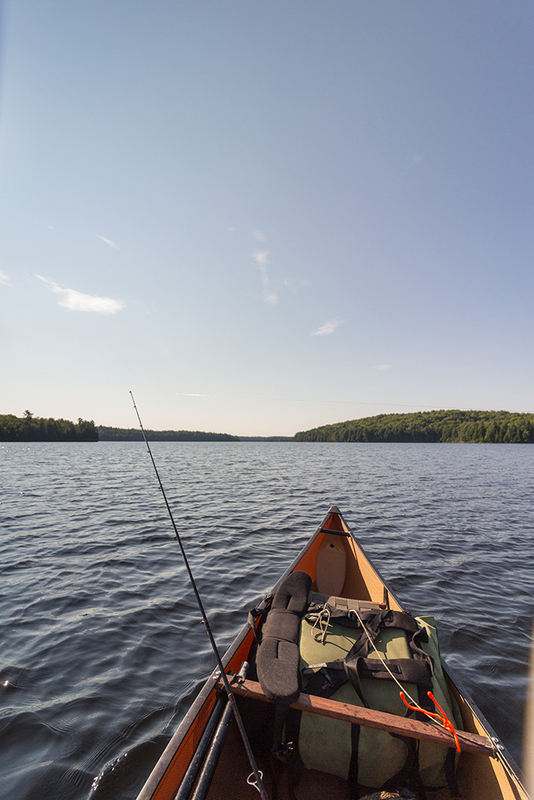 The plan for this trip was to visit some lakes that I had yet to see, and with the weather forecast looking almost too good to be true, I decided to take on some big water which I don’t normally like to do when I trip solo. My last minute decision would have me travelling from Kiosk into Manitou Lake, then down to Three Mile Lake (via the 3km portage) and then over to Maple and down to Erables for a night.. from here I would head down Maple Creek back to the Access point on the far side of Kiosk Lake. The only lakes on this route I have previously paddled were Kiosk and Maple. On Saturday morning I got a later start than I normally like too, I didn’t have my permit in hand until shortly after 8am. Luckily it was a beautiful morning and the notorious winds of Kiosk Lake were a non-issue. 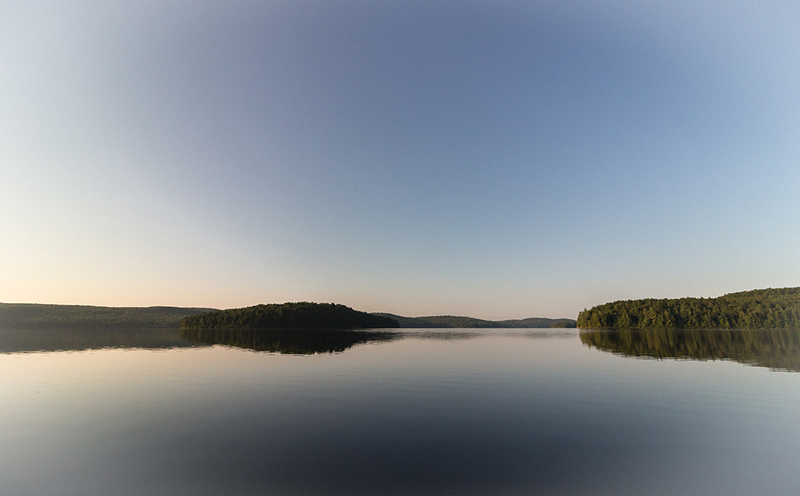 I made quick work of loading my canoe and setting off across the still waters of Kioshkokwi Lake. Time to get going! After a little swim of course. 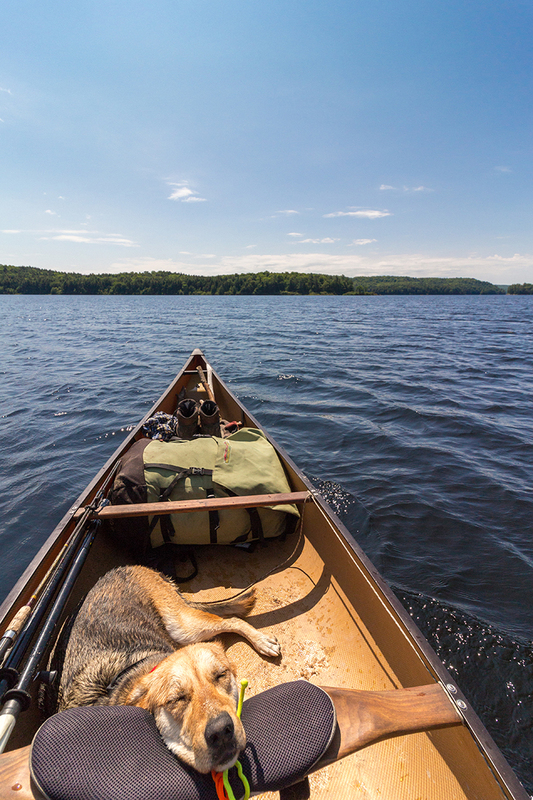 For this trip I had borrowed a canoe from work (Algonquin Basecamp) but after trying it out a couple of times I realized it wasn’t the right fit for tripping with my K-9 companion. 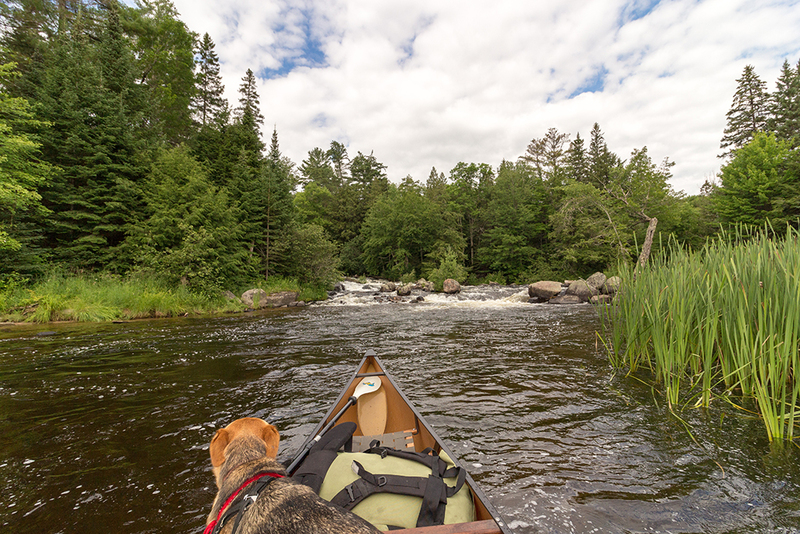 The canoe is a Souris River Tranquility which is a great solo tripping boat, but unfortunately it just isn’t wide enough to comfortably fit a 75+ LB dog and gear for 4 days. As a result I ended up using my 17ft Swift Prospector which obviously has plenty of room to spare. I did decide to bring along the double blade paddle that I took with the solo boat just because I was curious how well it would perform in the big boat. I used it for the entire trip across Kiosk Lake, and realized that it was a big mistake. The paddle was simply too short to paddle such a wide canoe and as a result it was very awkward to reach the water with. Not only that but I ended up with lots of water in the canoe, assuming because I had to use the paddle at such a steep angle to reach the water, it was dripping water on me with every stroke! It took me close to an hour to cross Kiosk Lake, and I passed many occupied campsites along the way. As soon as I passed the Junior Ranger Camp on ‘Sandy Point’ all of the noises from motor boats and fellow campers were behind me. 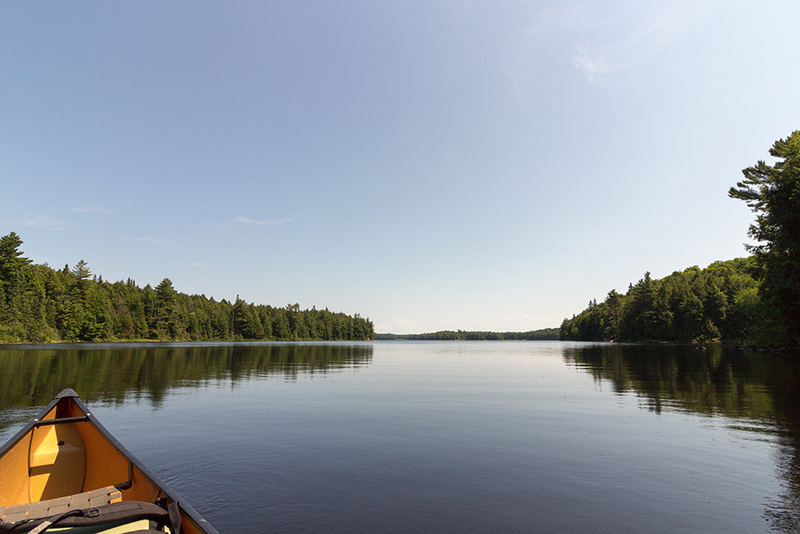 All I could hear now was the rushing water of the Amable Du Fond River, which I would soon be paddling for a few kilometers before reaching the final portage of the day into Manitou Lake. The first portage of the day (on the left) going across this small waterfall. The first portage of the trip was only a 265m trail around a small waterfall. 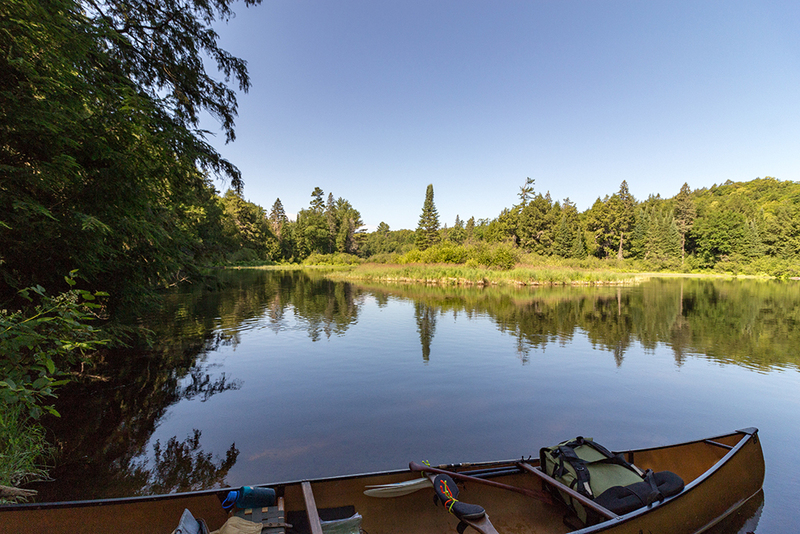 This portage is very straight forward and crosses a logging road near the beginning. In low water there is the option to stay on trail and meet up with the next portage just down river, which would add 440m to the trail. Because it basically hasn’t stopped raining all summer thus far, taking the water route was no big deal, as a matter of fact the water is still so high I couldn’t imagine ever needing to use the low water route. Back on the Amable Du Fond River after the 265m portage. 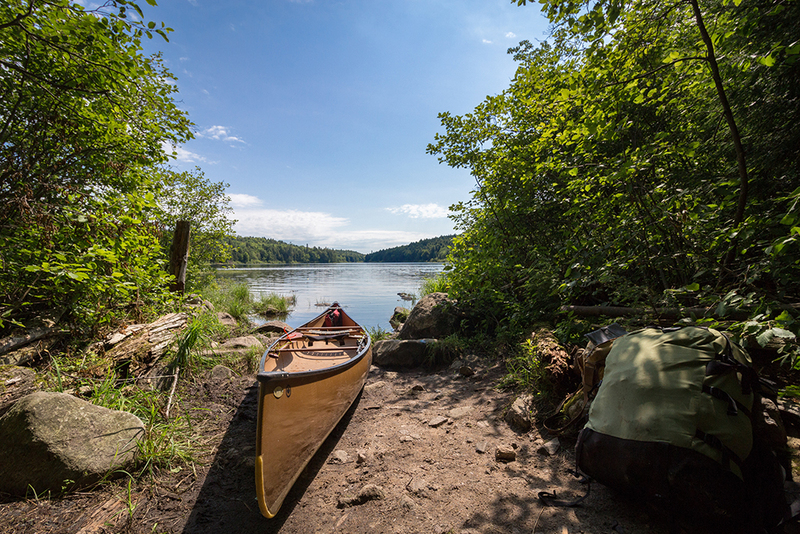 This section of river can be bypassed by an additional 440m portage, but it was unnecessary – Note the double blade paddle lashed in my canoe, that’s where it stayed for the rest of the trip! A few minutes later I approached the next portage which is a another short one, only 310m. This one goes around a very large waterfall that I wish I took the time to explore… because it is fairly close to the Access point I’m sure I will be back soon. Unfortunately I didn’t even get any good photos of this one. All I remember about the portage is it was a pretty steep climb, which was obvious considering the size of the waterfalls and I was going against the current, but it only took me around 10 minutes to single carry. Shortly after getting back on the river I approached a small swift that I thought I might have to line the canoe through… but I managed to power through it using my single blade paddle. If the water was slightly higher I don’t think I would have made it. Right after the small swift the river opens up and almost turns into a long, skinny lake with not much of a noticeable current. There are three campsites along this stretch, the first one being on river right. As I passed the first campsite I noticed the yellow portage sign for the 1355m into Manitou Lake. The campsite on river left looked quite nice, probably the nicest of the 3 by far. I single carried approximately half of this portage, the first half was relatively flat and easy going, but when I approached a steep incline I decided to put the canoe down and double carry from there. This turned out to be a good idea because it was quite a large hill, but after reaching the top the trail was very easy the rest of the way to Manitou Lake. When I finally reached the lake I was greeted by a huge beach, which is known to be one of the nicest in the entire park! I can see why! I quickly set my pack down on the beach and went back for the canoe. When I got back to Manitou I could hear what sounded like a motor boat, then a moment later I could see it going across the lake. It pulled up to shore just North-West of the beach, so after checking my map I realized there was a cottage there. What a way to spend a summer! I took a few moments to explore the beach and the nearby campsite (which wasn’t all that inviting). My dog Athena decided to lay down in the lake for awhile to cool down, it was around 30 degrees and there wasn’t a cloud in the sky, after all. It’s days like this that I wish I knew how to swim! 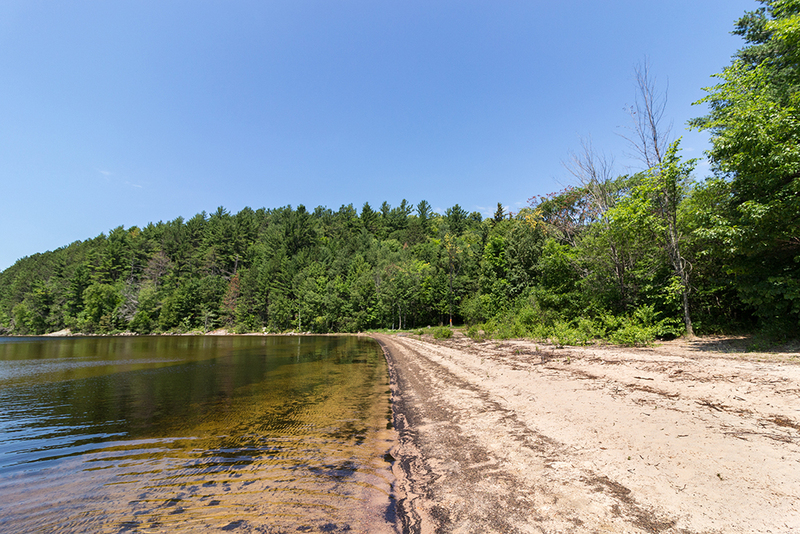 The beautiful beach at the end of the 1355m portage into Manitou Lake. The beach extends about the same distance in the other direction as well. Because I was done portaging for the day I took my boots off and played in the water with Athena for a few minutes, then got on the water. I passed by a few other solo canoeists on my way across the very large lake. My first stop was the campsites on Pine Island. I wasn’t very impressed with either of these sites, same goes for the sites on the island just North of this one. I decided to keep going for since I’d be heading to the other side of the lake the next morning anyways. 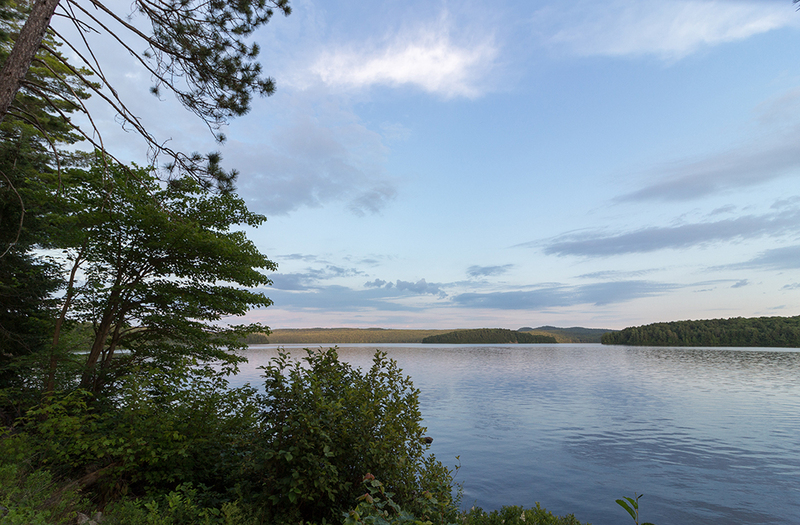 As I got back out into the middle of the lake I noticed the very small island with a single campsite, it looked like a great spot so that’s the direction I headed. As I got closer I realized it was occupied by another solo canoeist that I had seen earlier on in the morning. I think he started his trip an hour or so ahead of me. I kept going and ended up at the South-Western campsite on the next island that has 3 sites total. It was a beauty campsite! This would be my home for the night. As I lazed around camp for the entire afternoon I noticed how scenic this lake was. I was surrounded by mountains off in the distance. I bet this would be an amazing sight in the fall when the leaves start changing color as most of the canopy was dominated by hardwoods. Supper tonight was a grilled striploin steak with a Lipton SideKick. Nothing better than a fresh steak grilled over the fire! 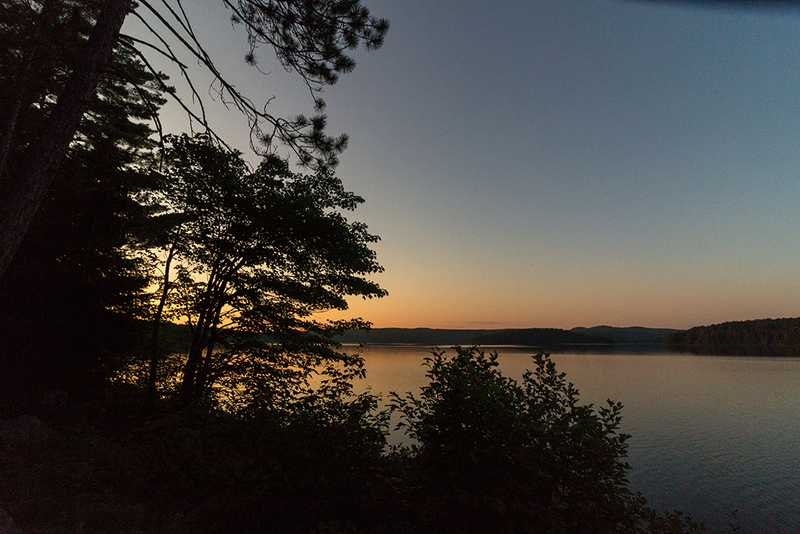 I capped the evening off with a small cup of whiskey while watching the sunset, which became a routine on this trip. 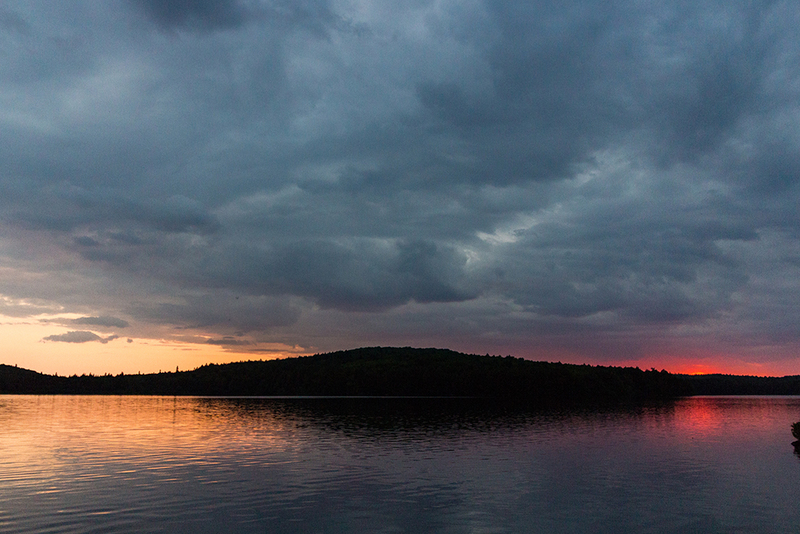 Originally I had planned to sleep in my tent without the fly tonight because when I checked the weather before my trip there was a 0% chance of rain overnight, but I decided I better put it on just in case because the sky started to look rather ominous just before sunset. Oh well, maybe tomorrow night?